1. Right-click the link to the PDF file then choose Save Target As (Internet Explorer) or Save Link As (Firefox). 2. In the Save As dialog box, select a location on the hard disk, and then click Save. 3. Double-click the PDF file to open it in Acrobat or Adobe Reader. 1. (Control) Click and hold the link to the PDF file then choose Download Link to Disc. 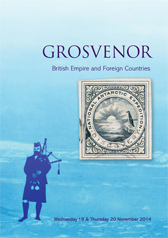 Copyright © 2019 Grosvenor Philatelic Auctions Ltd. All rights reserved.